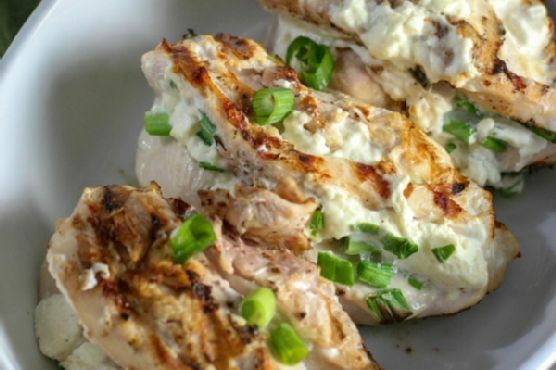 Stuffed Chicken Breast is a gluten free, primal, and ketogenic side dish. This recipe makes 4 servings with 298 calories, 22g of protein, and 22g of fat each. For $1.42 per serving, this recipe covers 13% of your daily requirements of vitamins and minerals. 4 people were glad they tried this recipe. Head to the store and pick up green onions, chicken breast, cream cheese, and a few other things to make it today. From preparation to the plate, this recipe takes about 27 minutes. It is brought to you by Pink When. Taking all factors into account, this recipe earns a spoonacular score of 68%, which is pretty good. If you like this recipe, you might also like recipes such as Stuffed Chicken Breast, Stuffed Chicken Breast, and B.O.A.R.S Stuffed Chicken Breast.